There's happy hour on the Strip, and then there's happy hour above the Strip. 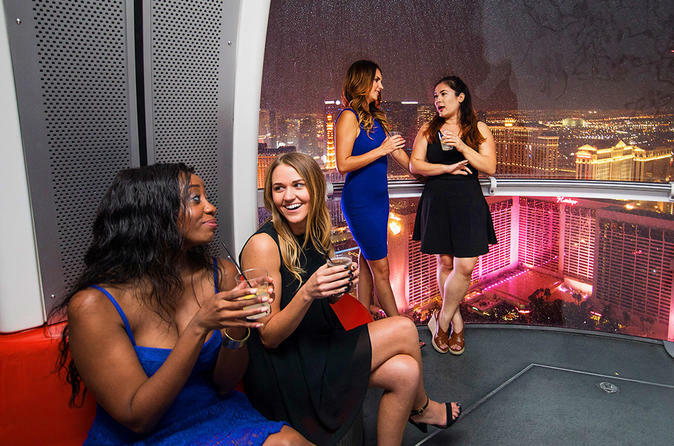 Hop in an climate-controlled pod and enjoy access to a full bar for the entire 30-minute revolution. The only thing you have to bring besides your ticket? Proof that you're 21 years old or older. Drink in hand, admire the neon-lit landscape as a recording of a witty narrator shares trivia about the city’s landmarks (only here will you find pyramids next to the Eiffel Tower). After the ride, browse in the Sky Shop for a reminder of your spin through Sin City’s celestial skies in the form of commemorative glassware or a tiny version of the High Roller itself. The observation wheel happens to be situated smack in the center of Las Vegas’ newest entertainment quarter, The LINQ. Graze on hearty American comfort food at Hash House A Go Go, or munch upscale Mexican fare at Chayo Mexican Kitchen & Tequila Bar. Not hungry? Head to the Brooklyn Bowl to knock down some pins, or browse a variety of shops in the area. Special Offer - Book with us and save between 9% and 11% compared to the local admission price! - Book Now!